Mongolia: land of endless green pastures, mountains and rivers, land of nomads and Kazachs in Western Mongolia, where the Altai mountains form the natural border between China and Russia. This relatively unknown environment offers fantastic territory for a Mountain Bike Challenge. You will meet wild Argali sheep, threatened with extinction and possibly a snow leopard. In addition tos even days of mountain biking options to undertake attractive walks and hikes are offered, as well as visits to authentic nomad and Kazach families, who show you their way of hunting with horses and eagles. They will teach you the Mongolian way ofshooting their longbows and apply specific materials. 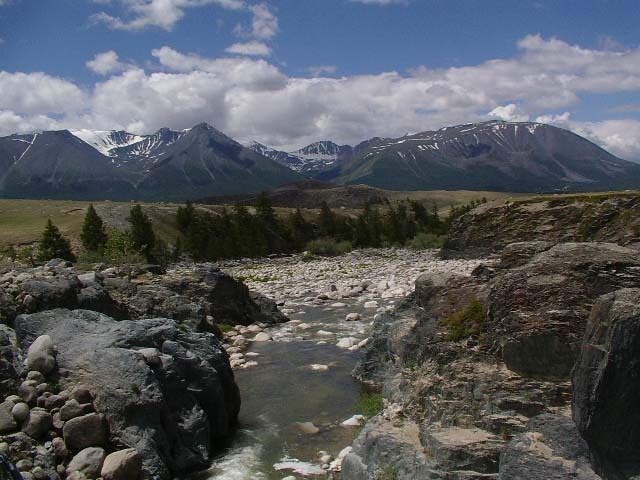 The mountain bike tours will take you through untouched natural scenery without cars, but garantees to enjoy blue skies, the gorgeous Altai mountains and its Kazach nomads in the western part of the country. These routes offer you challenging tracks amidst and over fantastic natural slopes, breathtaking landscapes and along huts of local people, showing you their withdrawn way of living, only aimed at authentic primary needs. The event will be organised with a minimum number of 5 participants. In case the event has to be cancelled, you will be informed not later than 4 weeks before the scheduled departure dates. When the minimum number of participants is registered, you will be informed directly on the exact dates the event will take place, including details regarding the travels involved. A bus transfer will take you from Ulaanbaater Airport to your hotel for a short tour briefing. During the rest of the day you might enjoy some leisure time. This morning’s program offers you a sight seeing tour, including a visit to the Gandan Monastery. Its monastic community, amidst the vast temple complex, is still active nowadays and harbours the tallest standing Buddha (26 m high) in Asia. In the afternoon a flight transfer will take you to Ulgi, in the centre of Bayan province. Later on you will be transferred by bus to a campsite, 5 km further down the road. Here we check our mountain bikes and will enjoy our first efforts of mountain biking along some local roads. This morning’s program starts with a mountain bike tour through untouched wilderness on the snow covered slopes of the mystic Altai Mountains. To further warm up, we will continue our 5 hour mountain biking and cover 50 to 60 km to the shores of Khovd Lake, where we will stay overnight. After breakfast we start our today’s mountain bike tour through the Khovd River valley, sometimes close and at other moments a bit further away from its shores. Serious climbing is involved till we reach Gurvan Pass at an altitude of 2400 m. We arrive in the central village of Tsengel province, where we will find our campsite for the night along the shores of the Mogoit River, some 2000 m high in the hills. 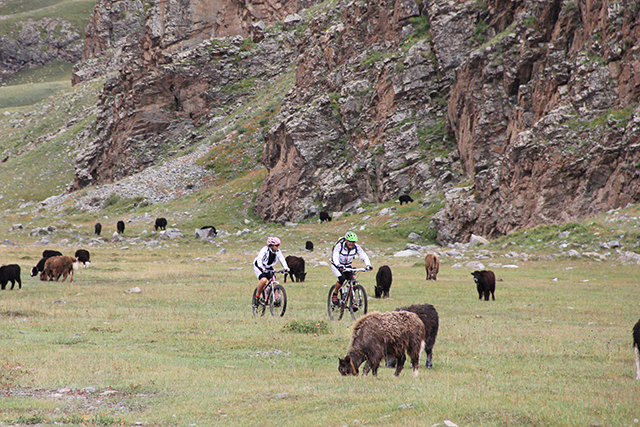 Today’s 60 km mountain biking will take us to the picturesque mountains of Khurgan and Khoton. 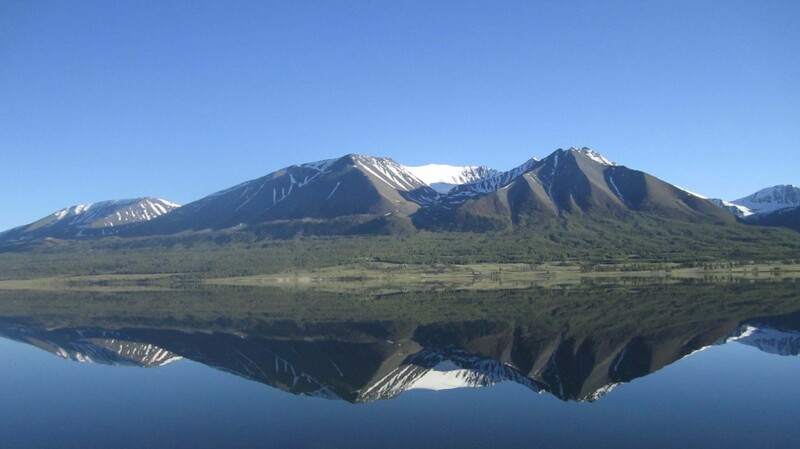 On our way back we will cross these mountain ridges and pass by Khuskuut at an altitude of 2500 m. We continue along the shores of Khurgan Lake, where rough, slopy terrain will lead us on to the campsite fort he night. A solid breakfast today forms a perfect preparation for a mountain bike tour around Khoton Lake at an altitude 0f 2100 m. On our way back we cross the local Rashaan and Tsagaan Us rivers, flowing through territory with rich ancient cultural heritage. It contains lots of deer, statues and cave paintings and drawings. After 70 to 80 km of mountain biking we reach our today’s campsite. A challenging 50 to 60 km mountain bike tour will take us along the shores to the right of the Khurgan Lake, covering rough terrain along small streams and over hills at an altitude of 2100 m. On the way we visit a Kazach nomad family and stay for the night at a local campsite. 4000 m high up in the mountains. When its water levels allow to do so, we cross streams along the way or bike over bridges when needed. We are amidst the slopy hills of the Kazak and Tuva country side, where ethnic Mongolians live. After 60 to 70 km of mountain biking, our lodgings for the night at a campsite nearby allow us to recover from today’s efforts. Today’s program offers exciting culture: we get to know and understand nomad traditions and style of living. We visit a Kazach nomad family who will show us their eagles to prepare these birds for the practice of hunting. In the afternoon we pay a visit to a Tuva family who will show us their traditional way of dairy making and teach us shooting their longbows. Dinner today will be a Mongolian barbecue. We continue our mountain bike tour with today’s 70 to 80 km to Sagsai River. On the way we cross the Urt Bulag River via a local bridge and continue along Khagiin Pass at an altitude of 2600 m. Late afternoon we will arrive at our today ’s campsite along the shores of Sagsai River. Today will be the last day of our Mountain Bike Challenge. It will lead us through open landscape and a river valley ligned by slopy hills and rocky cliffs. On the way we bike along a small lake towards the city of Ulgii, where the city center leads us to our today ’s campsite. 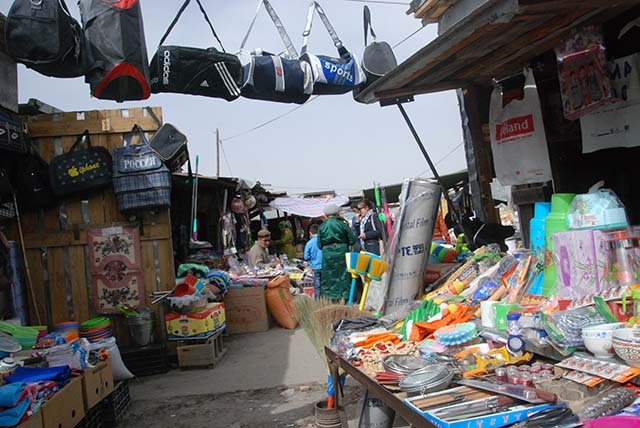 In the morning we will visit a local ethnographic museum and the market of Ulgii City. This afternoon lunch will be followed by a transfer tot he local airport in order to fly back to Ulaanbaatar. Today’s program allows us do some sight seeing in Ulaanbaatar and visit the National Museum, Nassan Square, Bogd Khan Palace and Zaisan Hill. We will enjoy traditional arts as well as a magnificent farewell dinner. A bus transfer will take us to Ulaanbaatar International Airport for aour flight back to The Netherlands.